What prompted me to write this is the result of a simple Google search for the word “Jihad”. Allow me to summarize the functionality of a Google search; how it is understood and intended to work. While my knowledge comes from a variety of sources, it is in line with well-known public authority on the subject of Search Engine Optimization (SEO), Matt Cutts. He is an employee and (until recently) a spokesperson for both Google and its search engine, and now works for the Pentagon. Google published an “overview” of how SEO works, but in a nutshell, Google searches for the freshest, most authoritative, easiest-to-display (desktop/laptop and mobile) content to serve its search engine users. It crawls, caches (grabs) content, calculates the speed of download, looks at textual content, counts words to find relevance, and compares how it looks on different sized devices. It not only analyzes what other sites link to it, but counts the number of these links and then determines their quality, meaning the degree to which the links in those sites are considered authoritative. Further, there are algorithms in place that block the listing of “spammy” sites, although, spam would not be relevant here. And recently, they have claimed to boost sites using HTTPS to promote security and privacy (fox henhouse?). There are a few exceptions with which I don’t think anyone would take issue: A search for a single word might bring up a dictionary or encyclopedia, but more often, they add Wikipedia to the list of results, especially if it is a particularly busy Wiki page that sees near-constant updates. There is a way to beat these results and get to the top; by paying for it. The Google Adwords service, places these ads at the top, but very clearly identifies them with a little “Ad” icon. Understanding the previously explained exceptions, let’s ignore the definition and Wikipedia link and skip directly to results three and four. 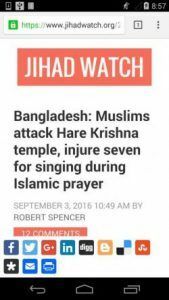 Robert Spencer (an accomplished author and prolific blogger) adds a minimum of 10 posts of Jihad-related news stories, daily. The search word “Jihad” is in the domain name, which always gives a massive boost. An analysis (jihad site:jihadwatch.org) of how many times the word “Jihad” occurs on JihadWatch.org shows that it is mentioned in excess of 35,000 times. This provides a solid enough validation that the main focus of discussion is “Jihad” and, therefore, increases its ranking. A search for just “jihadwatch.org” shows that it is mentioned on 631,000 other sites pages. This is the linking that I mentioned earlier used to determine the degree to which a site is consider authoritative and the number of references to JihadWatch.org are such that this further increases its ranking. JihadWatch.org is currently the 10,488th most popular website in the US. This fluctuates, but not by much. The site uses HTTPS and a responsive (mobile friendly) theme, so it looks great on any device. 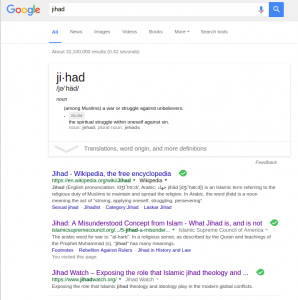 So, JihadWatch.org, objectively and without bias meets the criteria for top ranking sites resulting from a search on the word “Jihad”. But what about the site that outranked them and sits essentially at number one of sites that are neither the stock definition or Wikipedia link? This IslamicSupremeCouncil.org. I had actually never heard of them. So I made a few queries of people I know who have studied Islam. They had never heard of this group either. How, then, did they warrant such a high ranking that is (supposedly) based on unbiased criteria and algorithms? 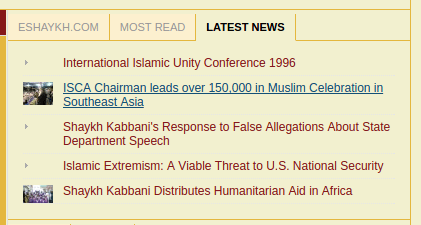 The site is run by Sheik Kabbani, a Naqshbandi Sufi, it has additional posts added a couple of times a year, the latest news panel lists an event in 1996.
ompared to the lesser-ranking jihadwatch.org that revealed a count of 35,000. As an aside, a search of the word “Sufi” results in 200 occurrences, which suggests the main focus of discussion is in fact Sufi and not Jihad. A search for “islamicsupremecouncil.org” shows that it is mentioned on 79,000 other sites pages; this is approximately 12% of how authoritative of jihadwatch.org is considered by SEO best practices. If you search the word “Sufi”, islamicsupremecouncil.org isn’t even listed in the first 10 pages of results. Allow me to add another example. Another site which is an authority on Jihad in the US is cair.com. It is the domain for the Council on American-Islamic Relations and is constantly being updated and far more popular than islamicsupremecouncil.org 146,590th place. It is actually even more popular in that it has a vast network of sites (a search for jihad site:cair.com gives 342 results) is mentioned and linked a whopping 60 million times, it is mobile friendly, has HTTPS enabled, and yet it does not even appear within the top 10 pages of results in a Google search on “Jihad”. So what’s up? How does the Islamic Supreme Council site get this boost? To answer that, we must consider the “why” and (more importantly) what the impact would be on the unknowing public of increasing the visibility (and perceived popularity) of sympathetic websites. the spiritual struggle within oneself against sin. The Sufis, however, represent a very small minority of Muslims, if in fact they can even be considered true Muslims. It should be noted that, in general, they are neither accepted nor recognized by the majority of Muslims, and many Sufis themselves do not identify as truly Muslim. They are unique in that, as pacifists, they embrace the peaceful “Greater Jihad” (the internal struggle with sin) and are often violently targeted for their beliefs in Muslim majority countries where “Lesser Jihad” is the enforced doctrine. 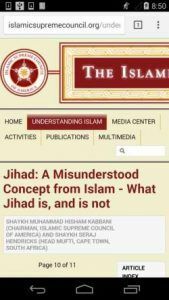 When someone in the US, perhaps wanting to educate themself on the subject, searches for “Jihad” and sees the Islamic Supreme Council as the top-ranked site, the perception is that this is the global, unbiased and authoritative view. If they click on that first, seemingly most popular link, their perception of Jihad will be skewed by the beliefs and doctrine of this peaceful group of people. These people who merely dabble on the edge of Islamic doctrine. These people who are themselves repeatedly targeted for their beliefs that are contrary to those of the majority of Muslims. These people who do not even come close to being any sort of credible or realistic representation of the larger and more prevalent subscribers (nay soldiers) of the “Lesser Jihad” (again, the violent kind). “Don’t be evil.” is the corporate motto of Google. While this may not be in their official corporate philosophy, this type of slogan lulls the general populous into a trusting state. We buy it. We believe that they are maintaining objectivity and that the technology is all based on mathematics, statistics and algorithms and not manipulated by any sociopolitical agenda. But that is not the case. There is, based on comparison of search results versus the criteria listed at the onset of this article, proof of social engineering. And it is not only Google who is guilty of this. Facebook has been at it also. Connections with the Obama administration, and now Clinton, are well documented. My enemy’s enemy is not my necessarily my friend, but here is what Julian Assange has to say on the collusion between the The US administration and Google. Updated 4th September 2016 with the kind assistance of a professional editor for clarity. Any Muslim will know that Sufis are not representative, it’s only us Kafir who don’t know the difference. There are so many examples of left wing bias, try demagogue that’s a fun one I just found, seems you need to be an orange haired American to be one. Jihad is interesting because of the faked top result. Like most computer companies greedy, un-American, liars and one of the reasons that Donald Trump won. CLINTON could not bring herself to state any of this because – it seems – she & the DEMOCRATS have taken money from the SAUDI state & cannot say these things ! The BRITISH are even WORSE if this is at all POSSIBLE with TOTAL DENIAL – even if LEAFLET hand outs from a MOSQUE are brought in to the BBC show – AMBER RUDD ignored the entire thing ! On top of this an IDIOT BISHOP – stated ad the Manchester VIGIL ( More \Cowardice Nonsense) that – WE MAY NEVER KNOW WHY this utter ISLAMIC MONSTER blew up 22 people & his family were given ASYLUM 22 Years ago – Pay Back for the generosity – 22 Dead in Manchester – This IDIOT was religiously Inspired & saw the CONCERT as a part of the DECADENT & IMMORAL WEST DEMOCRATIC Choices – & WE DO NOT KNOW ??????????????????????? ?